Delicious roasted vegetables with cheese sauce is a flavorful meal for lunch or dinner! This is a quick, easy and wholesome dish the whole family will love. What vegetables go with cheese sauce? Almost any kind of vegetable goes well with cheese sauce! 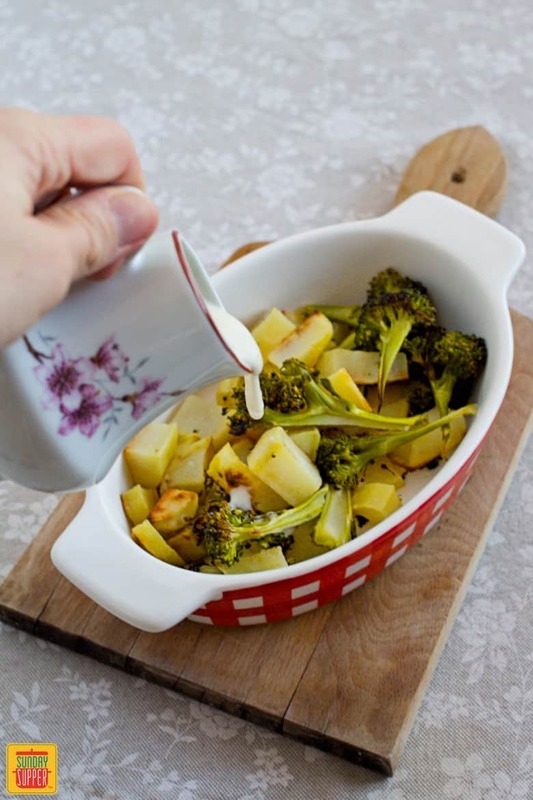 Our vegetables with cheese sauce recipe includes potatoes and broccoli, but cauliflower or sweet potatoes is another tasty option. Roasted or steamed, cheese sauce compliments vegetables perfectly. What do you need to make vegetables with cheese sauce? 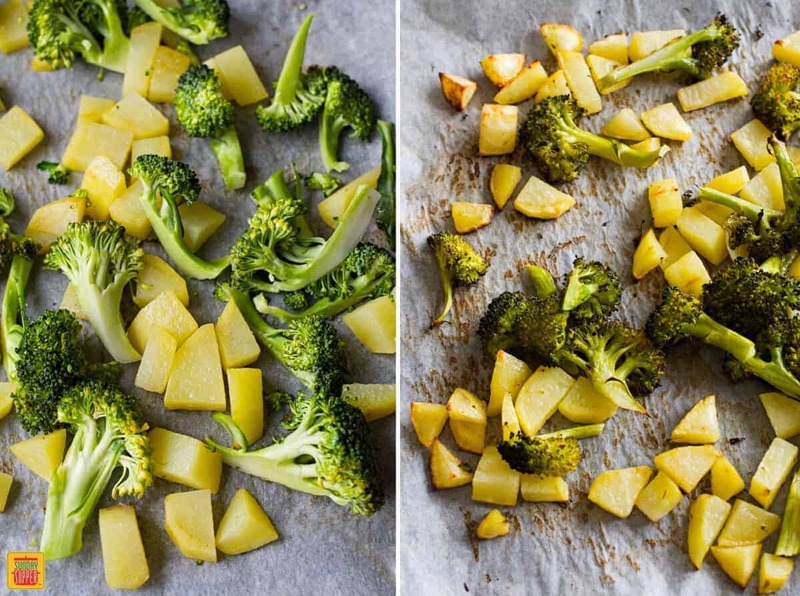 RECIPE TIP: You only need to add olive oil to the vegetables before roasting them. Extra virgin olive oil is my favorite, as it is one of the healthiest oils to use, and it guarantees a fantastic taste. If you don’t have it in your pantry at the moment, any vegetable oil works just fine. Are roasted vegetables better with cheese sauce? 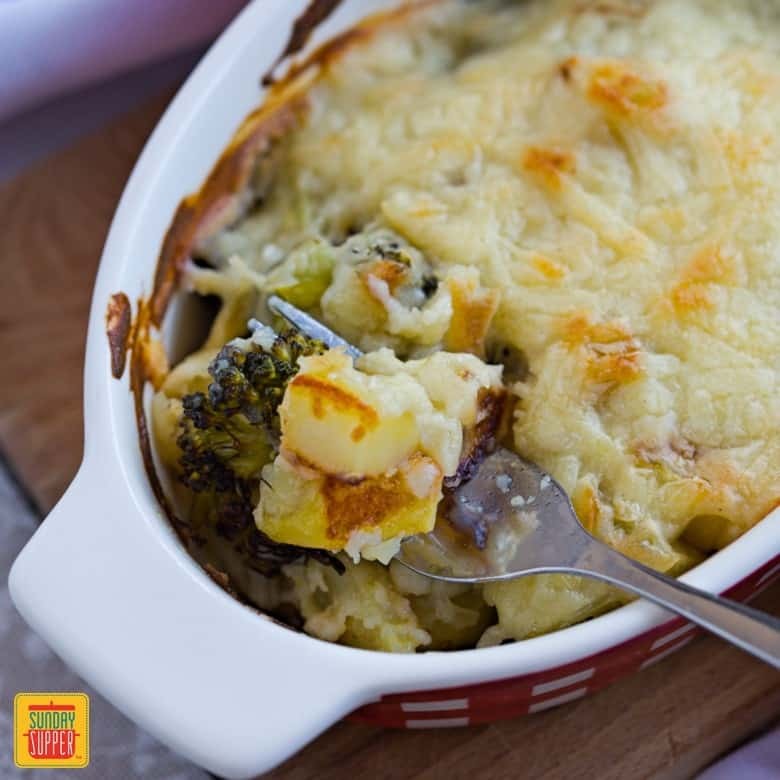 Roasted vegetables are great to eat just plain… however, with cheese sauce, they become fantastic! Homemade cheese sauce gives them so much flavor and a smooth, velvety texture. 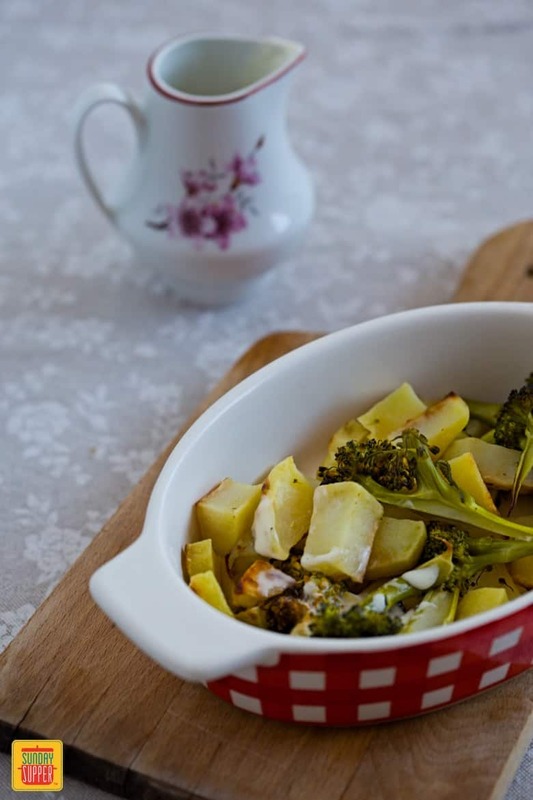 You will love eating roasted vegetables with cheese sauce. 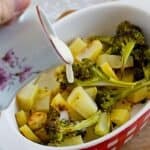 What is the best cheese sauce for vegetables? Any kind of cheese sauce goes well with veggies! You can season the sauce according to your taste before using it. For this vegetables with cheese sauce recipe, we recommend homemade cheese sauce with grated cheddar or Gruyère cheese. 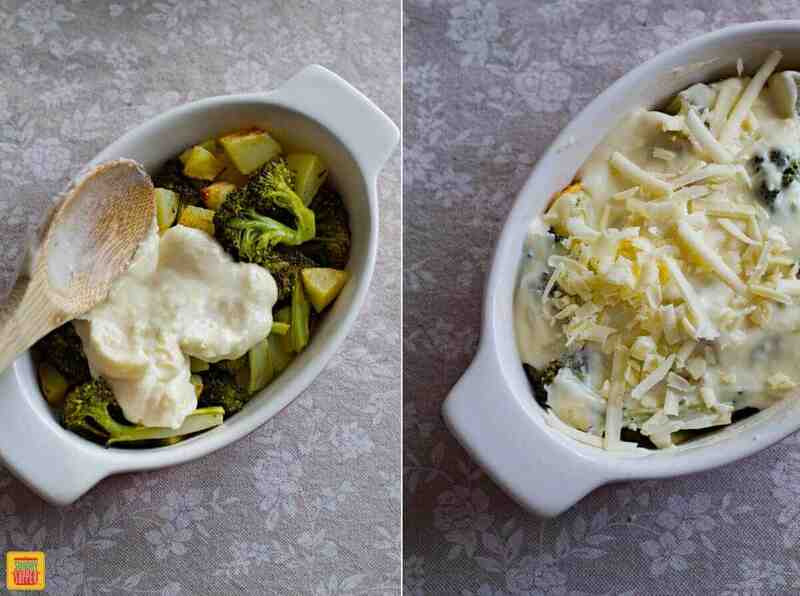 RECIPE TIP: You can enjoy your vegetables with cheese sauce two ways. 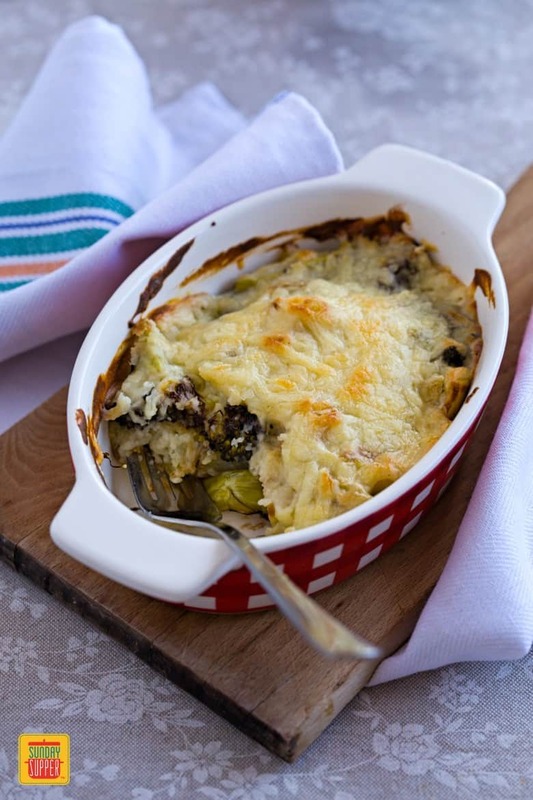 You can either simply top vegetables with cheese sauce right after roasting and enjoy them immediately, or grill them quickly in a baking dish, covered generously with cheese sauce and optionally with more grated cheese. Grilling creates a nice, delicious crust. When do you serve vegetables with cheese sauce? Roasted vegetables with cheese sauce is a great dish for lunch or dinner. Try it as a meal or as a side dish. 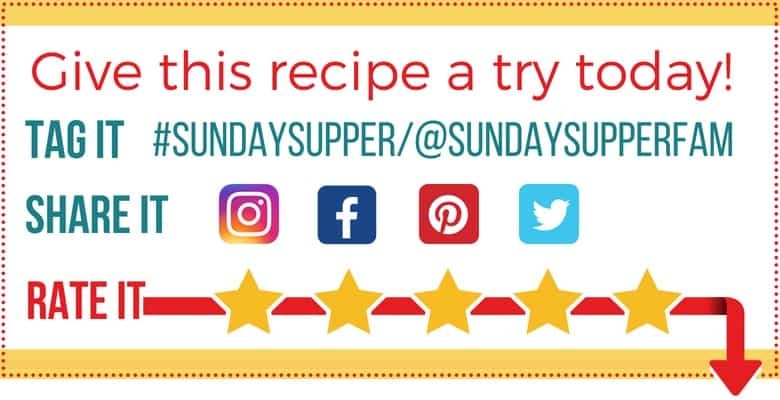 This recipe is suitable for any time of the year as you can use fresh or frozen vegetables of your choosing. Mix up your vegetables with cheese sauce recipe to use your favorite seasonal vegetables, and try different cheeses for a fun dish you can experiment with! Did you try making roasted vegetables with cheese sauce? Let us know in the comments! We would love to hear your thoughts. Place the vegetables on a large baking tin, covered with parchment paper. Sprinkle them with the olive oil. Using a spoon, mix the vegetables together with the oil, so they are as evenly covered as possible. Spread them around the tin. Roast for about 20-30 minutes, or until the vegetables are tender and slightly toasted. Serve on plates and top with cheese sauce. RECIPE TIP: For a delicious crust on your vegetables with cheese sauce, transfer the roasted vegetables into a baking dish. Cover generously with the cheese sauce and optionally, with some grated cheese on top. Grill for 5-10 minutes or until golden brown. Serve immediately. Daniela is a food blogger and weekend photographer with a corporate job. She loves baking and eating desserts, especially layer cakes. Experimenting in the kitchen is her best way to relax.